Avio CEO Giulio Ranzo (left), KARI President Lim Cheol-Ho (center) and Arianespace CEO Stéphane Israël (right) signing the Kompsat-7 launch agreement. Credit: Avio. 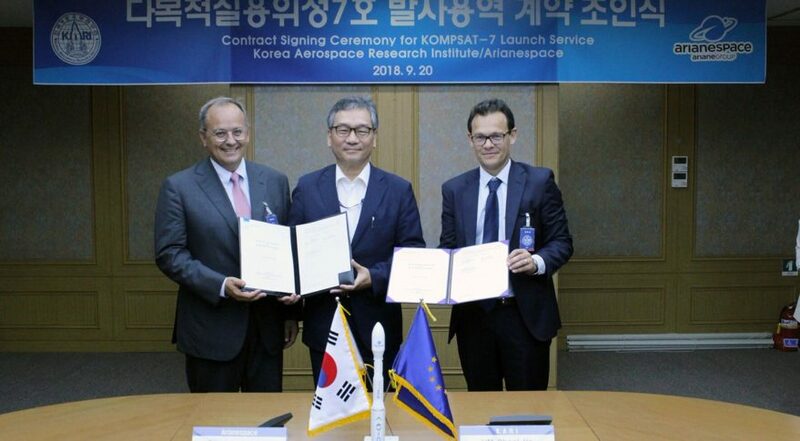 WASHINGTON — European launch provider Arianespace signed a contract with the Korean Aerospace Research Institute for a Vega C mission Sept. 20, growing the rocket’s backlog to five as its debut launch nears. Vega C is an upgraded version of the light-lift Vega rocket that Arianespace launches for satellites headed to low Earth orbit. The rocket’s first flight is “expected by the end of 2019,” according to Avio, the prime contractor for Vega and Vega C.
With a projected mass of 2,000 kilograms, Kompsat-7 is larger than the satellites that typically launch on Vega. The new Vega C can lift 700 to 800 kilograms more than its predecessor. Arianespace has four other Vega C missions on its manifest: an Italian Space Agency Cosmo-SkyMed satellite, the Thai space agency’s Theos-2 satellite, and four Airbus Defence and Space satellites split between two launches. All five Vega C missions sold to date are being used to launch Earth observation spacecraft. KARI has three other satellites launching ahead of Kompsat-7. Arianespace said it is in preparation for launches of GEO-Kompsat-2A and 2B, two larger satellites booked on Ariane 5 rockets. Arianespace did not give a date for the launches, which were originally scheduled for May 2018 and March 2019 respectively when announced in 2015. International Launch Services has KARI’s Kompsat-6 radar satellite scheduled to launch on a Russian Angara 1.2 rocket in 2020.